August 29, 2012: Tired of this, tired of that. I just want my toys to work. Which artist made that parody image? It's Botticelli's Snooki. I'd know it anywhere. A woman in a Spanish church "fixed" a painting's face, as pictured. Someone decided to push it further by photoshopping the same fix to B's Venus. Ah, thank you AC. Must have been from its philosophical ancestor, the banal "Amalfi Shore". 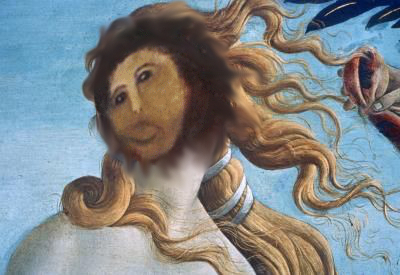 And, find on Twitter w/ tag #EcceHomo to see more, or if you want to join in the fun. You're in such a Goldfrappy mood today, Irwin. @Alison: I wonder if Irwin had a Gold Dust Milkshake--that can put you in a Goldfrappe mood. Rrrrufff! Woof, woof woof! Rrrruffff! Irwin! I got a bootleg copy of Banana and Louie's death certificates! Bet *you* think it's beneath you! Wow. This brings me back. @ Matt: From what I understand, Irwin drinks an angel dust milkshake every morning before his daily constitutional. A regular man is a happy man, as anyone over 35 can attest. Maximize your happiness, minimize your soberness! That gels with Irwin, all right! Nice Latin music! What would you call this "big band" style, salsa? @Dave B: It's laughable. Which in this case is very good. Thanks for that link Parq, now I can properly laugh. Das (and others), you are welcome. I have an elderly relative by marriage in Spain who, in the same situation, would probably have done the same thing. And Dave B, that's literally LOL. Is "Left Myself Behind" by Toy from Toy Rock and roll, because I like it! Can't get a man with a gun? It seems that's the only way I can get a man these days. She can't get a man with a gun? Well, hell, Irwin, she just doesn't belong to the right Facebook groups. I remember playing clarinet in the orchestra for the highschool production of Annie Get Your Gun - 22 years ago. I wish I couldn't. Woot! Love this bed music, a classic! 2/3 of me is listening to WFMU. The other 1/3 is working. So... I take it we should watch Betty Hutton. Is Betty related to Timothy, or is it just a common name? If you're not in Philadelphia PA, you may as well not even order a "Philly" cheesesteak! I can not find ANY decent one outside Philly itself! @Sean: But wear goggles, a helmet and safety coat, Irwin said that she's truly explosive. OH GOD I HATE ARIEL PINK I HATE HIM I HATE HIM I HATE HIM I HATE HIM I HATE HIM I HATE HIM I HATE HIM I HATE HIM I HATE HIM I HATE HIM I HATE HIM I HATE HIM I HATE HIM I HATE HIM I HATE HIM I HATE HIM I HATE HIM I HATE HIM I HATE HIM I HATE HIM I HATE HIM I HATE HIM I HATE HIM I HATE HIM I HATE HIM I HATE HIM I HATE HIM I HATE HIM I HATE HIM oh wait now I love him. Certain places outside of Harrisburg have also made very great ones--I think direct experience of the "real thing" is prob the surest way for a restaurant to make a pretty good one. What's up, nose of berlusconi? How's it feel being away from the centers of power again? @1in9: Many DJs, Irwin included, state that most comments are not programming-related. But nearly every comment to that point in today's show referenced either the music or the Image Meme Irwin posted to his playlist. We're left to infer that the "1 in 9 postings are about the show" comment cannot be taken as a literal statement of fact, and instead is only meant to provoke the curious to peruse the playlist and comments. Breadmen's (if they're still open) in Chapel Hill-Carrboro, NC also had good cheesesteak, only not quite as "Philly". I thought I didn't really care for him but now I kind of like him. Philly Cheese Steak outside of Philly would be ersatz. As with anything trying to be recreated. When I speak, people listen. I never listen to this show, I just come to look at the pictures. This is excellent. So much better than the karaoke version I did two years ago. High Plains Sigh, love the name she has for her label. This song may be "unreleased", but I think I have this one. It's either a CD bonus track or a digital download from her site. @G: Anything that sells this playlist to the curious, may give them a prod to take a peek and jump on in. This is highly bittersweet. "Goodbye Yellow Brick Road" was my late father's fave. G, Irwin's "one in nine" remark was not intended to be a factual statement. I am playlist curious (yellow). 4 out of 5 dentists recommend Trident to their patients who chew gum. @woodwind: Wow, combined with the song itself that would be quite bittersweet. Similarly "For The Good Times" was my grandmother and late grandfather's song--always bittersweet to listen. Oh gosh, Roy Smeck. Thanks, Irwin! This whole set is wonderful. @Matt: Have you heard Johnny Cash's version of "For the Good Times"? Stirring. Amazing effect, steel guitar love song about honeymooning in Buffalo NY! @woodwind: I haven't, but I can bet that would sound GREAT. I saw had a suspicious movement after lunch today. Does that count? Dammit, can't get the stream to work! But based on the playlist, I'm reminded of the Lester Bangs essay on the Troggs I just read a week ago. Perfect time for the Terry Stafford Elvis imitation. I would like to report suspicious DJ activity. Well, hell, Irwin, that includes everyone on this comment list. I don't have the time to fill out all that paperwork. Oh, hello Caryn! Long time no type! OK, now officially listening. 'Sup, Irwin and peoples? "Place this card under your phone. Don't hang up, keep caller talking. Questions to ask: When is the bomb going to explode? Where is it right now? What does it look like? What kind of bomb is it? What will cause it to explode? Who placed the bomb? Why? What is your name? What is your address? Is there more than one bomb? Exact wording of the threat: "
Hello (once again today!) Carm! Hey Trio! Danke & Cheers from Frankfurt/Germany. Guten Abend ralf! Danke und Prost! The bathroom ambush episode of 7SD I would not count as a failure at all. They tried to get people to steal money & goods from the bathroom, but actually wound up with MORE being left there than they had set up. It's only a failure in that Andy failed to prove most people are more evil than he. Hey now old pal. Hey all music lovers. Hey Nineteen. I can't understand the words. Reg Presley. Nice! Love the Troggs, particularly, With A Girl Like You. Woo, she's singing that embarrassment and love exist in Hell. Hell is other people, so said the existentialist. That's a good one. Ooooh, I remember this version of "Take Five"! LOVE it! wow!! great cover of take 5! We hate you for your freedoms, Irwin! Okay, now I'm completely confused. You HAVE to play the song about Freedom!! It's BECAUSE you are FREE to so, that you MUST play it!!! FREEDOM!!! Now we love you for your freedoms. Irwin - you are normal and want your freedom. Understood. This guy probably resents being patted down at the airport gate. Uppity! Need I say it? "Freeform is freedom"!! Whoa! Buddy Rich quality of drummin' here! I just feel so trapped in this song, I can't explain it. "Lighthouse's self titled album! Get Buddy Rich kind of drumming, in a Clay Pigeon kind of band!" @Laura: Perhaps you tried to escape from it, but were held back by the "machine gun fire" of those drums! I forget, do we hate or love Ariel Pink? Is he suspicious? I think of freedom each time I look at a couch. There is on average a thousand pounds of skin in/on a couch. Because isn't it true that people shed about a thousand pounds of skin a year? This song is the prettiest I've ever heard about self-abuse. These Ex Cops are quality pop rock. Strong hook, and a jangly feel! I am just fake..I mean fact checking on that thousand pounds. Good one mark: "fake checking", fact checking when you're very sure the other person is wrong! Guess who freedom fact checks stuff... Yes! You know who! Can't believe I'm listening to Captain Beyond! Nobody knows how many pounds of flesh gets left on couches. Even here on Irwin's forum. I bet it is close to one thousand pounds. I bet back in the seventies during the orangutan craze some of the skin from them went on some couch. "The moderators and admins have confirmed this thread; this is actually President Obama." IAmA actually has quite a lineup of famous people scheduled to go on Reddit--take a look at the right column. Hi Irwin, Actually listening live for once.... Nice orange! The skin/couch thing is real because you know how hard it is to lift a friend's couch when you help him move. Must be about a thousand pounds of skin in those couches that people ask to help you move. All right! Amazing show Irwin, thanks! Look forward to Jason Karaban and Marco B coming in!